It’s been two years from the events of the last novel. And for those two years Ian Troy, a magic-using Shinree, has been a slave to the magic-suppressing drug kanyl. In a haze, he has worked in the mines, performing back-breaking labor for the man defeated him—Drakon. Now Drakon and his Shinree ally are threatening to control the known world. Only the Crown of Stones can stop him. And only Ian Troy knows where it is. The resistance has no choice but to risk exposure to save him. Ian Troy awakens to a world he may want to forget as he struggles to piece together the fragments of his life and deal with the acts he has committed. Again, it all falls in his shoulders. And he may be too scarred to carry them. Magic-Scar is a great follow-up to Magic-Price. More nail-biting action, whirling plots, and characters whose true motivations are hidden. Schneider delivers another fast-paced fantasy novel, expanding her world building and revealing new secrets and mysteries to the Reth family and the truth about the ancient Shinree empire. Again, Schnieder writes the book in first person from Ian Troy’s perspective. It keeps her protagonist in the heart of the action because anything he doesn’t witness has to be told instead of shown, and no one wants that. Again, it works great in this book, helping to drive the intensity of the plot. Fans of exciting, fast-paced fantasy will enjoy the world Schneider has created with her Crown of Stones Trilogy. If you haven’t read the first novel, pick it up. And if you’ve had, why haven’t you dived into book three? 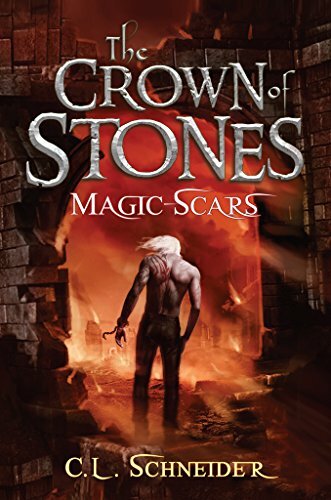 You can buy Crown of Stone-Magic Scars from Amazon!